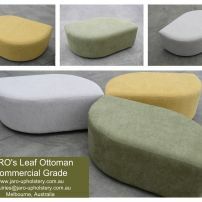 commented on "Commercial Grade Leaf Ottoman manufactured in Melbourne by JARO"
JARO's new Leaf Ottoman comes in many colours and textures to match your venue. Other shapes are also available including a petal. You can design a flower, brick wall, snake and so much more. Click on picture for more info.